Get hands-free help in any room. Just start by saying, “Ok Google”. Just say "OK Google" and enjoy your own unique benefits from Google Assistant. - Receive answers to almost anything from Google Assistant. You can also get the latest sports, finance, news updates, and more. Maximum of 2 orders per household, and each will need to be made with a different card on the google site to avoid any getting cancelled. Google Home Mini Smart Assistant - Chalk - New & Sealed. Condition is New. Dispatched with Royal Mail 1st Class. Google Home Mini Smart Assistant - Chalk 100% Off Code! Google Home Mini Smart Assistant - Chalk. Condition is New. Dispatched with Royal Mail 1st Class. I will give you a code that lets you get a google home mini for free on there store! 4.5 out of 5 stars - Google Home Mini Smart Assistant - Chalk 100% Off Code! 426 product ratings426 product ratings - Google Home Mini Smart Assistant - Chalk 100% Off Code! Sent directly from Google, 100% new boxed and sealed. You will need to complete the checkout process for £0.00 on the Google Website. Max 1 orders per Household. Great for mounting your Mini device quickly, easily and securely to an electrical outlet with very minimal wire on show. It also makes the device quick and easy to move to different rooms if required. It is a smart speaker. There are no other fees. Ordering more than one code is at your discretion, and we are not responsible if your order gets cancelled. You will receive your code minutes after receiving. Google home mini. Brand new sealed. Fast dispatch. Charcoal. 5 out of 5 stars - Google home mini. Brand new sealed. Fast dispatch. Charcoal. 10 product ratings10 product ratings - Google home mini. Brand new sealed. Fast dispatch. Charcoal. Google Home Mini Smart Assistant - Chalk. Brand new in box. I also have compatible hue accessories for sale so please check out my other items. This mount is 3D printed using recycled plastic material so may have very small imperfections but this will not affect functionality. I have 2 options available, to mount the mini above or below the socket. (Screw to wall - any common screw should be fine but go slow to protect the plastic. If you fancy another colour just ask :). Google Home Mini Smart Assistant - Chalk Brand New & Sealed Unwanted item recieved dirctly from google! Thanks for viewing! Now you can take your voice assistant with you wherever you go, just connect to Wi-Fi or use your smartphone as a hotspot and go. Capacity: 10,000 mAh. Conserve more power. Unit size (mm) H 50 x W 133 x D 133 mm. Just say "OK Google" and enjoy your own unique benefits from Google Assistant. You can also get the latest sports, finance, news updates, and more. Use your voice to dim the lights, adjust smart thermostats, lock your front door, play music from WiFi-connected speakers, and more. Google Home Mini Brand New And Sealed Chalk. Condition is New. Dispatched with Royal Mail Signed For® 2nd Class. Google Home Mini Straight To Your Door!! Google Home Mini Smart Speaker - Charcoal. Condition is Used. Works fine. 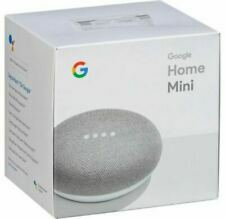 Google Home Mini 100% Off Promo Code. You are buying a code not a physical product. Google Home Mini Smart Speaker - Charcoal. Condition is New. Dispatched with Royal Mail 1st Class. 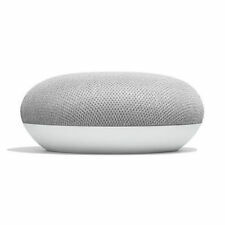 Google Home Mini Smart Assistant - NEW. Condition is New. Dispatched with Royal Mail 1st Class. Google Home Mini Smart Speaker - Charcoal - New / Boxed / Sealed. Condition is New. Dispatched with Royal Mail 1st Class. 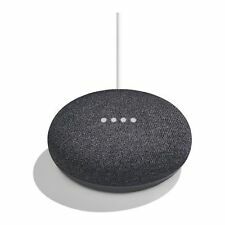 Google Home Mini Voice Assistant *Actual Product* CHARCOAL OR CHALK- CHEAP DEAL! Chalk more available than charcoal. Select the right color that matches your room and personal style. A powerful little helper. It's your own personal Google. Get answers from Google. Also works with Arlo. 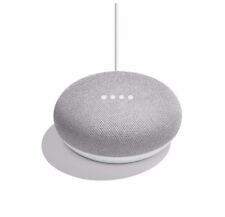 Google Home Mini Smart Assistant - Chalk, Brand New Sealed..
One of the most popular developments in technology in recent years, voice assistants are found in homes all around the country. Google Home Mini voice assistants are compact and easy to use, giving you access to the intelligent Google Assistant. From light coloured models to darker units, you'll find a Google voice assistant to match your home. The Google Home Mini is designed to make your life easier. This smart speaker uses Google Assistant to search the web for quick results, perfect if you're in need of a recipe when deep in a cooking session. To activate this smart assistant, simply say 'Ok Google' and ask a question. You can translate words, get weather updates or find out the latest football scores. Google Assistant also helps with your schedule, allowing you to set reminders. Pair your Google Home with your Chromecast to stream shows, watch videos on YouTube or view your favourite shots on Google Photos. 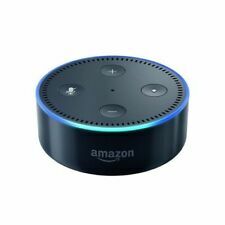 You can even use this smart speaker to work with your smart home as it's compatible with a range of different systems, like Phillips Hue and Nest. Wifi connectivity lets you search the web whilst a Bluetooth function lets you pair your smartphone for music streaming. The 360-degree speaker with a 40mm driver offers a truly amazing listening experience. Choose your Google Home Mini voice assistant in either chalk, charcoal or coral to match your home. This easy to use voice assistant features four LED lights and two buttons for volume control, making it sleeker than ever. Saying "Ok Google" activates the Google Home Mini, displaying the four LED lights. When searching, the LED lights blink one after another, and when answering, the lights blink together. You can easily turn off the mic with a switch at the back. When the mic is off, the LED lights turn from white to orange.